Madera Floorstanding Merchandiser - Cal-Mil Plastic Products Inc. 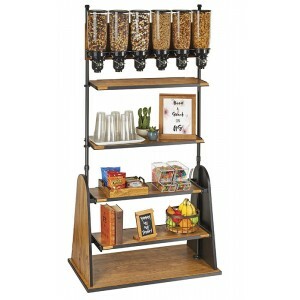 The Madera Merchandiser Station is the perfect way to create a statement and provide plenty of snacks at the same time. This freestanding display ships flat and is a U-Build. Display anything from signage to simple accent pieces on the shelves, or create a unique snack station by purchasing item 3741 (6 Cylinder Snack Dispensers)!